I remember our first Christmas in our new house... It was a wide open house, with twelve sliding glass doors and a ring of picture windows overlooking the lake. Set back in the woods for privacy. No curtains or blinds. Nothing to separate us from Nature. There was fresh snow on the ground and black ice on the water, and the Christmas tree in our living room merged with a backdrop of evergreens outside. The floodlights from our deck revealed red cardinals in the trees, perched like living ornaments scattered about. Everything was clear, beautiful and bright. It would be our first Christmas without Dad. I was eleven and trying to help out. Mom was still wrapping presents in the back room, which was unusual. For the first time, I led my younger brothers through the Christmas Eve traditions: hanging stockings, writing Santa, and putting out Oreos and coke. After changing into our new red pajamas, we gathered for a Christmas photo. But Mom wasn’t sure how to use to camera; it wasn’t her usual job. Dad had always been in charge of holiday fun. And his fun was like magic. We always looked forward to his surprises - a talking pumpkin at Halloween, a life- sized bunny at Easter, a vision of Rudolph at Christmas. And always, there was his music. Sing-a-long songs he would play on his guitar or clarinet. That year, we tried singing Silent Night without him. But Mom started out too high and none of us could hit the notes for heavenly peace. If Dad were there, we would have done better. But he had been working really hard, and got so exhausted that he had to go-to-the-hospital-to-get-some-rest. We hadn’t seen him or talked to him for several weeks. This seemed unfair. I could understand that he might need a break from my noisy brothers, but I was older. I was old enough to know how to behave and be quiet. “Tomorrow,” Mom promised. “Tomorrow we will go to the hospital together.” Yay! Christmas Day with Dad! I tried to imagine his room at the hospital – filled with cards and presents and flowers - and I was certain that even though he was tired, he would be waiting to greet us with a special holiday surprise. I went to the living room and drank Santa’s coke. I ate his cookies too, and used my slippers to make footprints in the ashes of the fireplace. Dad would have done that if he were there; I didn’t want my baby brothers to be disappointed. The blinking lights on our Christmas tree were reflected on three sides by sliding glass doors. Little flashes of color peppering the darkness outside. Our house looked sparse in this light, half-full, half lived-in. We hadn’t had a chance to settle yet. The only sound was the hum of the refrigerator. It was cold everywhere; the heat was turned down low. My brothers woke up early Christmas morning and we yawned through a blur of activities: opening presents, eating cinnamon buns with scrambled eggs, and choosing a red bow for the dog. We dressed in our new Christmas sweaters and finally, we were ready to go visit Dad. Mom had baked a Christmas ham. We packed a plate of food for Dad and wrapped red socks and a plaid scarf and a cone-shaped cardboard angel covered with gold glitter. Fairfield Hills Hospital sat high on a hill, a cluster of brick and white-shingled buildings around a central green. It looked like a cozy New England college campus - safe, secure, full of promise. Surely this was a good place, a worthy place, and Dad would get better soon. As we walked up the pathway to Hanover Hall, I noticed all the windows on the upper floors had bars on them. How strange. At the entrance, a guard with a gold badge checked his list for Mom’s name, and then buzzed us through the door. How unusual. Was this really a hospital, or something else? The linoleum floors were dirty gray and the chipping plaster walls were more gray than white. There were patches of sallow yellow and green showing through. It was hot and dry, and there was a clank and hiss of steam heat. The elevator took us to the third floor, the Anderson Ward, and an attendant in blue was waiting to let us in. He had a heavy ring of keys. There were two sets of glass doors, each reinforced with mesh wiring, and each set was double locked. An attendant in white came to meet us inside, and escorted us down the long hall. The hall was dimly lit, with old fluorescent ceiling fixtures covered by more ugly mesh wire. And a strong smell was everywhere – a human smell– soiled, crusty, in need of a bath. Patients were shuffling along the hallway, dressed in Johnny coats, some moaning, some talking to themselves, some pausing to bang their heads against the wall. Midway, a group of men sunk into brown vinyl chairs, staring at a mounted TV, entranced. None seemed to be in their rooms. I could see a window at the end of the hall, and just in front of it, an artificial Christmas tree. Silver, covered with plastic candy canes. It had no lights. And there was a person pacing back and forth, head down, fingers clutched, slippered feet dragging along. The attendant guided us toward this figure, and said something quietly to Mom before he left. She gently laid her hand on the man’s shoulder and kissed him on the cheek. I felt my cheeks grow hot, and my heart beat so loudly I could hardly hear. Everything faded into grayness as the man looked up, and I saw some vestige of my father’s face. My brothers hid behind my Mom, but I just stood there, waiting for him to become himself. If I could just be still enough, or grown-up enough, maybe he would talk to me. Maybe he would smile. Maybe this would all go away. He looked at me without recognition. With glassy, faraway eyes, and lines of drool threading his chin. There were stains on his Johnny coat from drooling before. He had lost a lot of weight and appeared fragile. I offered him our bag of gifts, and he slowly unclenched his hand. His fingernails were long and curled, yellowed with dirt. 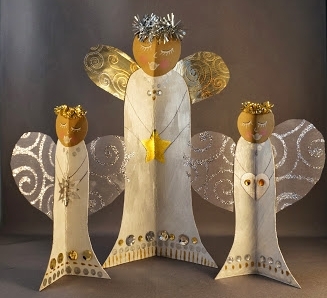 He pulled the cardboard Christmas angel from the bag, and his wrists and hands began to shake. Soon his shoulders and back were shaking too. He stood there looking at the angel as if it were a corpse, and looked at each of us as if we were to blame. Tears welled up in his eyes as they darted and searched the hall as if he were in danger. Finally he settled his gaze on Mom, hoping for help. She lifted the angel from his hands, looking quickly for a perch, and placed it as a crown on top of the silver Christmas tree. Dad settled down in a brown vinyl chair and began rocking back and forth. He curled himself into a little Christmas ball, breathing in and out in timid puffs. Mom gathered my brothers by the hands and beckoned me to come. Lord help me, my easy God has gone. Now I have none. Please help me, my easy God is gone.